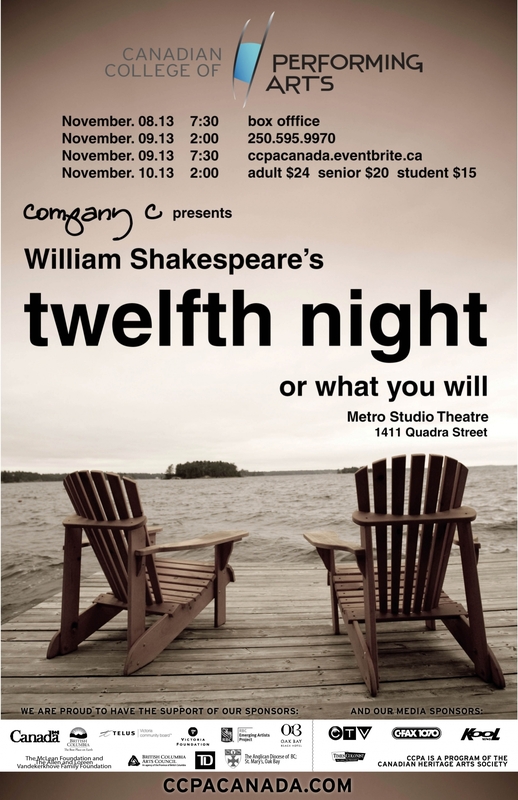 I’m happy to announce a ticket contest for the up-coming production of Twelfth Night by the Canadian College of Performing Arts (CCPA) Year III students, Company C, November 8 – 10th at the Metro Studio Theatre. The students are part of the cast and most of the production roles, a unique experience for Canadian artists so close to launching their professional careers. “This program gives us the courage and skills needed to become more than just actors. I myself have a much clearer idea on what it really means to put up a show,” says Alex Dorward who plays Olivia and is providing sound design for the production. The cast will mount the classic Shakespeare comedy, Twelfth Night – Downtown Abbey style. Stratford director Darcy Evans is staging the show with a feel not unlike the popular British television show. Set in the early 1920s, chambermaids, butlers, and footmen worked to run the house for the nobles, as in Twelfth Night. Twelfth Night tells the story of a ship-wrecked girl Viola, who disguises herself as a man, Cesario, to be hired to serve the Duke of Illyria. The Duke, Orsino, uses ‘Cesario’ to woo the maiden Olivia on his behalf. However, Olivia ends up falling for ‘Casario,’ and Violia falls for the Duke. This epic love triangle becomes the main plot for the show, with drunken uncles, fools, and mischievous chambermaids popping in along the way. This comedy is sure to leave audiences laughing. As Maria, the head chambermaid, says: “If you desire the spleen, and will laugh yourself into stitches, follow me”. Comment on this blog post with the last Shakespeare play (or film) you saw. I’ll draw for the tickets on Tuesday November 6th at noon, and will contact you by email or Twitter. You have 24 hours to contact me and let me know if you can make use of the tickets. If you can’t redeem the giveaway, or I haven’t heard from you within 24 hours, I will re-draw the tickets. The tickets can be used for any one of the shows, and must be redeemed by contacting the CCPA Ticket Office, 250 595 9970. I have close ties to CCPA – my son, Elliott Loran, graduated from Company C in late 2007 – and am happy to help spread the word about their excellent shows. The last film I saw was Joss Whedon’s Much Ado About Nothing. The last play was Victoria’s Shakespeare Society’s Merry Wives of Windsor. I saw both Joss Whedon’s film and Merry Winves of Windsor too. Good luck! The last Shakespeare play I saw was Hamlet this summer at Bard on the Beach in Vancouver. thanks Doug! Are you going to see Kenneth Branagh in Macbeth (National Theatre Live at Silver City)? I last saw a Shakespeare play, The Merry Wives of Windsor, on the grounds of Camosun College in August! me too! I loved the transposition and the motorcycle was genius! The last Shakespeare movie I saw was Joss Whedon’s Much Ado About Nothing. It was fantastic! I really enjoyed it. I loved Much Ado About Nothing. There’s so much live Shakespeare in this town to enjoy. Hope you get a chance to see some. Congratulations to Penny Routledge who is the winner of tickets to Twelfth Night. (I use Random.org to generate the winning prize number).